So you think bannock is a great campfire recipe, but have you ever actually tried bannock? If you go to Youtube you will find dozens of bannock video recipes. You can learn how to cook bannock on a camping stove, on a hot rock, and even on a stick, and each video states the bannock is so delicious. I even provided some of those bannock videos on this website. But I must tell you that bannock is one of the most disgusting camping foods I ever ate. Not only is traditional bannock completely tasteless, it also sits in your belly like a stone for about a day. For experimental purposes I revised my bannock recipe so that it’s not so disgusting. 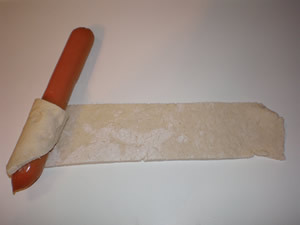 I tried wrapping a hotdog in bannock and baking it in a real oven. It didn’t turn out so great but I think it may have potential with some work, but I won’t pursuit if any further. I tried mixing cinnamon and dried cranberries with my bannock, this was a slight improvement, but very slight. 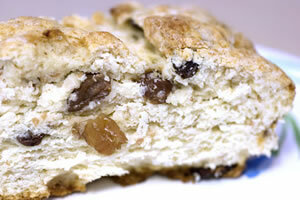 Finally I mixed raisins, cinnamon, and honey in my bannock, and it turned out decent – sort of. Mix 3 cups of flour and all remaining dry ingredients in bowl, slowly add water and stir gently until thoroughly mixed. Add remaining wet ingredients, i.e., honey and canola oil. Due to all the extra ingredients your mix may require additional flour. Once thoroughly mixed knead the dough mixture for several minutes, flatten out a bit but do not roll flat, this is already a very dense, heavy bread. You can choose your own method of cooking but I suggest cooking your bannock in a greased pan in an oven, dutch oven or something other than on a hot rock or on the end of a stick.